We invite you to read the jubilee fair magazine! A fair magazine dedicated to both the Exhibitors and Visitors and all tourist industry stakeholders. “Once again, the Ministry of Sport and Tourism is a patron of TT Warsaw. No one needs to be reminded of how prestigious the event is. The fair is always a time when not only Polish but also international tourism get a boost of energy for their further development. The previous 25th anniversary edition gathered over 20 thousand visitors and was one of the main travel industry events in Central and Eastern Europe. “I am honoured to once again assume honorary patronage over the TT Warsaw International Travel Show. Last year’s jubilee edition shown that this is one of the most important events of the tourism sector in Central-Eastern Europe. I am particularly pleased by the fact that as the partner country of the previous show Poland could particularly present its diverse offer of tourist places and highlights, with the Polish Tourism Organisation stand distinguished by a prestigious award in the Homo Touristicus competition as the second best, most original and professional trade show booth. “The TT Warsaw Fair is unique, as it enables Polish and foreign tourism entities to meet at the business level at the same place and time. It offers them a great opportunity to make contacts, to mark their market presence at home and abroad, and to present their offer to a wide audience. I am pleased to invite you to participate in the 26th edition of the TT Warsaw International Tourism Fair 2018 held for many years by MT Targi Polska – a Member of the Polish Chamber of Tourism that rendered great service to the tourism industry. This major industry event is to be held once again at the Palace of Culture and Science – one of Warsaw’s most recognisable buildings and one of the Warsaw fair’s first venues. We are happy to see the most important Polish industry event returning to the very heart of the capital. “26. edition of the International Tourism Fair TT Warsaw once again in November and the traditional location of the Palace of Culture and Science will certainly bring a lot of new experiences, observations and conclusions to discuss the role and significance of trade fairs in the development and promotion of domestic and foreign tourism. For the Polish Tour Opersators Association, participation in this event is an honor and pleasure, ideally in line with statutory goals in the promotion of our members’ activities. Tourist fairs have been invariably very popular among consumers for years and are at the forefront of the most-visited trade fairs in the world. For the last quarter of a century, TT Warsaw has grown to the rank of the most important trade fair event, extremely well-deserved for the promotion of tourism. 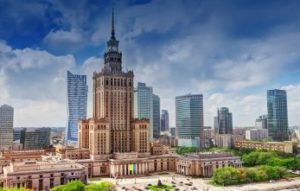 There are, after all, few forms of running a business that directly affect the building of a positive image of the tourism industry like the activity of MT Targi Polska, the organizer of TT Warsaw”.